It’s a beautiful time of year in the nursery. Every time we turn around, there’s something else in bloom. And this year the perennials are added to the mix. 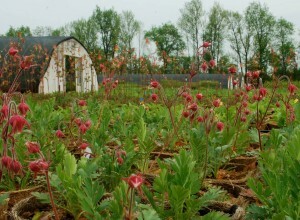 Prairie Smoke (Geum triflorum) in bloom. The flowers are small and delicate. Two weeks ago the prairie smoke (Geum triflorum) started blooming. Their flowers are pretty and delicate, partially closed up & bud-like, though some petals are visible. This week the second attraction has started. The seed heads are starting to show. Prairie Smoke (Geum triflorum) seed heads. They are also known as Old Man's Beard. Once pollinated, the bowed flower heads slowly raise themselves upward, turning into tufted seed heads. The process has been quite slow, so the display lasts for weeks. They are beautiful! 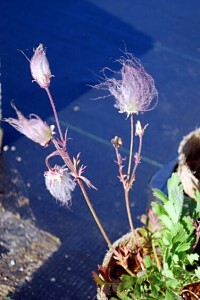 Prairie Smoke (Geum triflorum) is a prairie species, enjoying dry areas in full sun. In fact, they will not bloom without enough sunshine. They stay relatively small, making an excellent addition to the residential garden.